Beijing, CHINA: At least 36 people were killed and 13 injured when a packed bus slammed into a wall at the mouth of an expressway tunnel in northern China, authorities said Friday. 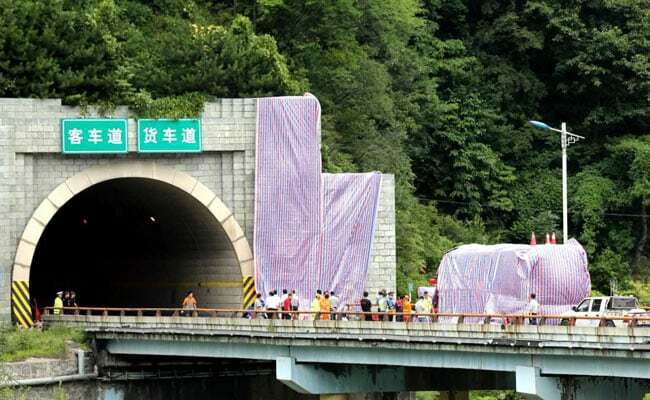 The bus appears to have struck the wall just outside the tunnel as an AFP photo showed authorities placing a long tarp over to the right of the entrance, with another cover concealing the coach, which was a few metres back on a bridge. Earlier photos published by the official Xinhua news agency showed that the front of the red bus had caved in due to the force of the crash. The photos showed a tow truck at the scene along with rescue workers surveying the damage on the bridge just outside the tunnel near forested hills. Twisted metal was strewn in front of the bus, several windows were broken and a front tyre was blown out. And in July last year, a coach crashed through a highway guardrail and plunged into a canal near the northern city of Tianjin, killing 26.